The Cup Café is a local restaurant that offers classic breakfast with a modern twist! We are a family-owned business that serves breakfast and lunch with a smile. We first opened our doors as Kimmie's Coffee Cup, serving great comfort food in a warm and comfy atmosphere. Now, as The Cup Café, we offer homemade, delicious breakfast and lunch with our own take on the classics. We are still that same great taste and friendly service, with a new name! with bell pepper and onion or hash browns, and toast or homemade biscuit and gravy. Two eggs, choice of potatoes, choice of toast or biscuit and gravy. The Cup Cafe’s house made sausage patty served with three eggs any style, choice of potatoes and toast or biscuit and gravy. 1/2 ham steak, two pieces of cherry wood smoked bacon and two sausage links served with three eggs any style. Choice of potatoes and toast or biscuit and gravy. Grilled English muffin topped with two poached eggs, shaved honey ham and our tangy hollandaise sauce. A freshly baked homemade biscuit topped with our homemade patty sausage and two eggs any style, smothered in gravy. Grilled English muffin, two poached eggs, cherry wood smoked bacon, avocado and tangy hollandaise sauce. Grilled English muffin, two poached eggs, tomato, red onion, spinach, avocado and tangy hollandaise sauce. Choice of thick cut cherry wood smoked bacon, ham or sausage, bell pepper, onion and home fries scrambled and topped with cheddar. Our house made sausage, bell pepper, onion, home fries and cheese scrambled together, topped with homemade country gravy. House made sausage, Ortega chili, jalapeno and diced corn tortillas scrambled together with jack and served with choice of potato. Three eggs scrambled with chorizo. Served with corn or our tortillas and choice of potatoes or rice and beans. Crispy corn tortillas topped with beans and two eggs any style, ranchero sauce and cheese. Choice of potatoes or rice and beans. A giant our tortilla stuffed with scrambled eggs, bacon and cheddar. Served with pico de gallo and sour cream. Choice of potatoes or rice and beans. Three scrambled eggs, homemade sausage, Ortega chili, bell pepper, jalapenos, tomatoes, diced corn tortillas topped with green onion, sour cream and avocado. Choice of corn or flour tortillas. Flour tortilla stuffed with scrambled eggs, cheddar cheese, ham, bacon or sausage and your choice of potato. Our delicious Chili Relleno smothered in ranchero sauce and served with two eggs. Choice of rice and beans or potatoes and corn or flour tortillas. Two freshly baked homemade buttermilk biscuits, split and smothered in our own country gravy, served with two eggs any style, two pieces of dry aged cherry wood smoked bacon or two sausage links and your choice of potatoes. Our omelets are made with three farm fresh eggs and your choice of any four ingredients from the list below. (Add additional items for .79 each) Choice of potatoes and toast or biscuit and gravy. Breakfast sandwiches are served with choice of potatoes. Sub fruit cup, cottage cheese or sliced tomato for potatoes. Fried egg with honey ham, bacon or sausage links, lettuce, tomato, cheese and mayonnaise on your choice of bread. fried egg, lettuce, tomato and mayonnaise served on your choice of bread. and choice of bacon, ham or sausage links served on a fresh flaky croissant. a hint of cinnamon and vanilla. Our old fashioned waffle with oats, pecans and almonds. French toast rolled in oats, almonds and pecans for a crunchy twist. Served with brown sugar, raisins, milk and butter. Cold sandwiches are served on your choice of bread with fries or homemade potato salad. Choice of turkey breast, honey ham, pastrami or roast beef, mayonnaise, lettuce, tomato, red onion and choice of cheese. House made egg salad with lettuce and tomato. A classic! Honey ham, turkey breast, cherry wood smoked bacon, lettuce, tomato and mayonnaise. House made with chicken breast, chopped pecans, celery, lettuce and mayo. House made white albacore tuna salad with lettuce and tomato. Your choice of any cold sandwich served with a cup of soup of the day or a garden salad. Half size of any one of our signature salads served with a cup of homemade soup of the day . Choice of blue cheese, ranch, 1000 island, Italian, chipotle ranch, honey mustard, Asian, Caesar, raspberry walnut or balsamic vinaigrette. Turkey, ham, cheddar cheese, tomato and sliced hard boiled eggs served on a bed of fresh greens. Grilled chicken breast, corn, tomato, jack and cheddar, black beans and tortilla strips on a bed of greens. Romaine lettuce and croutons tossed with freshly grated parmesan cheese and Caesar dressing. Grilled chicken breast, tomato, red onion, and grilled corn served over fresh greens and topped with BBQ sauce. Chicken breast, avocado, tomato, bacon, blue cheese crumbles, chopped egg and seasoned croutons on a bed of fresh greens. Our white albacore tuna salad or signature pecan chicken salad top our fresh house garden salad. 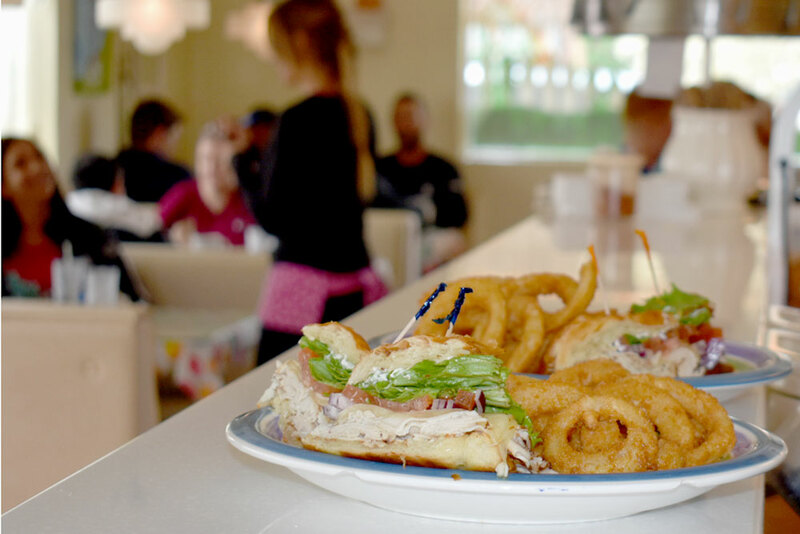 Sandwiches are served with your choice of fries or homemade potato salad. Thinly sliced pastrami grilled and topped with Swiss cheese and pickles on grilled marble rye. roll served with au jus. Our white albacore tuna salad, cheddar cheese and sourdough grilled to perfection. Thinly sliced pastrami, Swiss cheese Sauerkraut and 1000 island dressing on grilled marble rye. Topped with Ortega chilies and melted Swiss on a French roll.Served with au jus. Hebrew National all beef hot dog. Half pound Angus chuck patty, grilled onion, Swiss cheese and 1000 island dressing on grilled marble rye. Thinly sliced steak or chicken smothered with grilled onion, bell pepper and melted pepper jack . Cheddar and Jack on choice of bread. Turkey breast, Ortega chilis, sliced tomato and jack cheese on grilled sourdough. Choice of cheddar, jack, American, Swiss or pepper jack cheese. Cheddar cheese, grilled jalapeno and spicy ranch dressing. Thinly sliced pastrami and cheddar top this burger. Dry-aged cherry wood smoked bacon, avocado and your choice of cheese. Dry aged cherry wood smoked bacon, cheddar, crispy onion rings and BBQ sauce. Grilled chicken breast, romaine lettuce, green bell pepper, kalamata olives, red onion and feta cheese tossed with Italian dressing wrapped in a our tortilla. Grilled chicken breast, romaine lettuce, freshly shredded parmesan cheese tossed with Caesar dressing and wrapped in spinach tortilla. Grilled chicken breast, grilled corn, green leaf lettuce, avocado and jack cheese tossed with chipotle aioli wrapped in a chipotle tortilla. Ground beef, shredded cheddar cheese, iceberg lettuce, tomato, red onion, avocado and 1000 island dressing wrapped in flour tortilla. Baby spinach, bell pepper, red onion, avocado, cucumber and jack cheese tossed with sundried tomato aioli and wrapped in a whole wheat tortilla. We feel so blessed for each and every one of you. To thank you for your patronage, we have set up the Cup Café frequent diner program. To join, just text CUP to 55678. Then, check in at the kiosk in the lobby every time you dine in or pick up. It's that easy! We would love to hear from you! To reach us, contact us directly or fill out the form below.